You’ve finished cleaning your fireplace from top to bottom and it looks as good as new. So the time arrives to clear up the mess you’ve made. What are the safest ways to dispose of ash and soot, without causing damage to any of your furniture or your health? Since you’ve cleaned your fireplace, the remnants of the ash and soot will now be cool enough to remove. 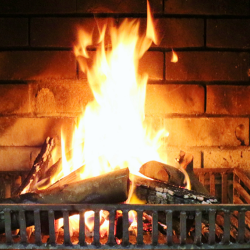 If you were to just remove ash and soot after using your fireplace you would need to ensure the ash is left to cool for at least 3 hours before removing. A fast removal process for soot is simply to vacuum it with a vacuum cleaner. Simple, fast and effective with minimal mess left behind. When using this method it is wise not to use any brush attachments as the bristles can work the soot further down into a carpet, creating more work for you. However if you are not keen on coating the inside of your vacuum with soot there are other options. An old clay plant pot or a metal can are sufficient containers for removing soot and ash. Scooping the remaining debris with a fireplace shovel or spade keeps direct contact with the soot at a minimum and keeps it away from any other piece of furniture in your home. Taking the filled container outside, the debris should be kept away from the home to prevent the smell infiltrating your furnishings. To eliminate the odour, wet tea leaves or coffee grounds are ideal cheap methods to use. Using the same method, the remaining elements of soot and ash can be transferred into small metal containers and then disposed of with your everyday rubbish. Keeping the soot inside a metal container will prevent the possibility of any fires starting in your bin. If the possibility is still a concern tip some water or other non flammable liquid over the soot once it is in the container, before sealing it closed. Taking preventative measures when removing soot and ash from your home is a wise course of action. Although it is no longer in your fireplace, the soot itself could still pose as a threat towards your family and should still be treated as a hazard even after cleaning. Disposing of it quickly and safely will minimise the chances of risk. When you are ready to tackle cleaning any Ash, Soot and Grime for you Fireplace and cooker give Soot Buster a go. Two great cleaners delivering great results easily. Always remember to take extra care when removing Ash and Soot.